Devon Clifford, drummer for You Say Party! We Say Die!, collapsed on stage forty minutes into the Abbotsford dance punk band's music set just before midnight on Friday night. Drummer Devon Clifford collapsed midway through performing a song with his Abbotsford band, You Say Party! 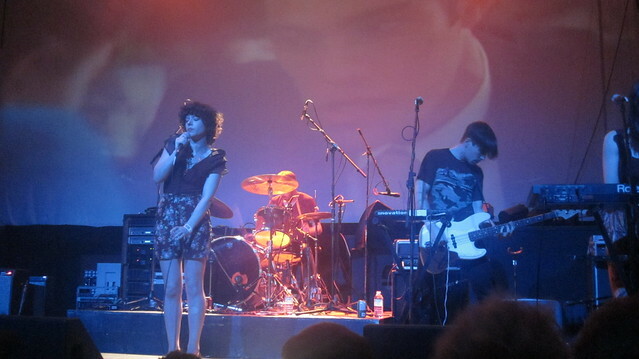 We Say Die!, on stage at the Rickshaw Theatre on East Hastings near Main Street on Friday night. Lead singer Becky Ninkovic, band members, and stage crew immediately stopped the performance mid-song and attended to him. He laid motionless on the stage unresponsive for several minutes. It is thought he suffered a brain hemorrhage while performing on stage at the all-ages show. Concertgoers started dialing 9-1-1 quickly at the request of Ninkovic. Fire fighters and ambulance arrived on scene shortly after midnight. Clifford was seen partially conscious several minutes after the incident right before paramedics arrived. Many in the audience were confused as to what happened, wondering if it was part of the performance or if Clifford fell due to the intensity of his performance. It became clear it was a medical situation once crew started clearing the stage of equipment to give Clifford air and space while laying him on his side. It was announced shortly thereafter that the rest of the dance punk band's performance would be cancelled due to the incident. Clifford was then taken to hospital. Hi guys, Devon had a brain hemorrhage during YSP's performance last night and underwent subsequent neurosurgery around 3 AM at Vancouver General Hospital. He is currently in the ICU and is on full life support as of this morning. We are hoping for a miracle, knowing that the prognosis is poor. Devon has passed away, he will be missed by many..